Many months ago, I called Kogo at Slovanský dům my overall favorite restaurant in Prague. That's still true. There are many reasons for that, not all of them having to do with the food. There is something very comforting and familiar about the place for us. We've been there countless times over the years. There's a history. Kogo had a few dishes that were long-time, regular favorites. Those favorites are still there, even though the menu changed recently and the prices have gotten higher. We went the other night and had a wonderful dinner. 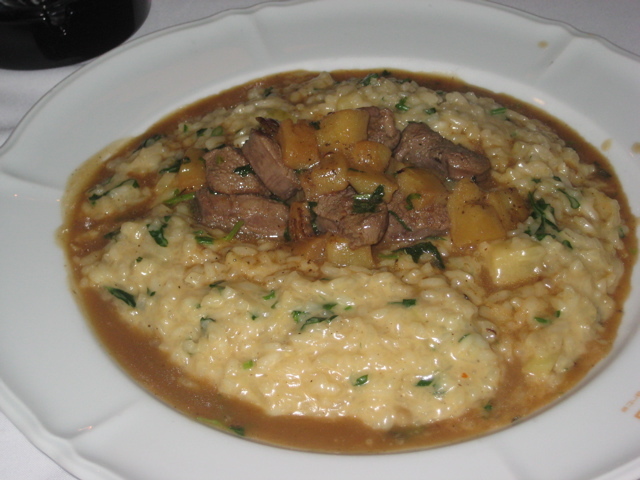 I've written in the past about my love for Kogo's risotto alla pescatora (295 CZK). V ordered this great seafood dish, and we love it as much as ever (see the earlier post for more pictures). It is a very filling dish with fresh calamari, octopus, and mussels. I still think it is one of the best bargains for great food in Prague. Mama, it was good. This creamy, chewy risotto is heavily infused with savory, wonderfully flavored lamb gravy -- so much so that it pools around the edges of the dish. The fresh mint is a delight with every bite. There were also small cubes of eggplant on top. The cubes of lamb on top were a little overcooked for my taste. By themselves, they were not so special, but mixed together with the risotto on the fork, and it was a wonderous combination. V and I shared our risottos, and switching back and forth between the dishes made me appreciate it even more. They are very different, but both have their strengths. I'll still go for the seafood risotto on occasion -- but the lamb is now at the top of my comfort food list. I wasn't in a big picture-taking mood this evening, so there are no more photos. We also had beef carpaccio (310 CZK). It was a decent version, with plenty of rucola, shaved Parmesan cheese, and lemon wedges. It is also worth noting that after serving Budar beer for many years, Kogo has switched to Pilsner Urquell. It is 55 CZK for a .3 liter glass. I'll also say that although the restaurant was quite busy on a Friday night, we had excellent service. Our waiter gave us professional courtesy and efficiency. He was there when we needed him, gave us space when we didn't, and fixed our table when he noticed the slightest wobble. I know plenty of people out there who also love Kogo. And, as my last post on the restaurant revealed, there are some who disagree. Such is life. Go try the lamb risotto. Then let's talk. Ye Gods! It looks like a plate full of vomit! Jeez -- I hate that word. Did you have to be so graphic??? It is pretty dark tin Kogo these days, so the unflattering flash photography will be less of an issue. I was going to write that it doesn't look good -- but I tell you, it had me from the first bite. I gave V a bite and it was one of those moments where, there's a pause and then you see enjoyment register on someone's face. Of course, I've hyped it pretty high now -- but really, for me, at least, it was really great. I've been back home for 2 years now and still think about Kogo! I think almost everytime I went there(about once per week), I ordered the carpaccio and it was always good. Risottos in Kogo are wonderful, incredible, definitely the best you can get in Prague. But new prices of other dishes, especially starters, are just crazy. 310 CZK for Carpaccio or 245 for Bruschetta al pomodoro really makes me look for another restaurant for Friday or Saturday evening.. True -- the price for carpaccio, a starter, is eye-popping. I'm amazed the seafood risotto is still under 300 CZK. I should also note that as if this writing, the price of the lamb risotto on their internet menu incorrectly stated it was 285 CZK -- my receipt and the menu at the restaurant said 385 CZK. Not cheap.